Download "The Work Opportunity Tax Credit (WOTC): An Employer-Friendly Benefit for Hiring Job Seekers Most in Need of Employment. 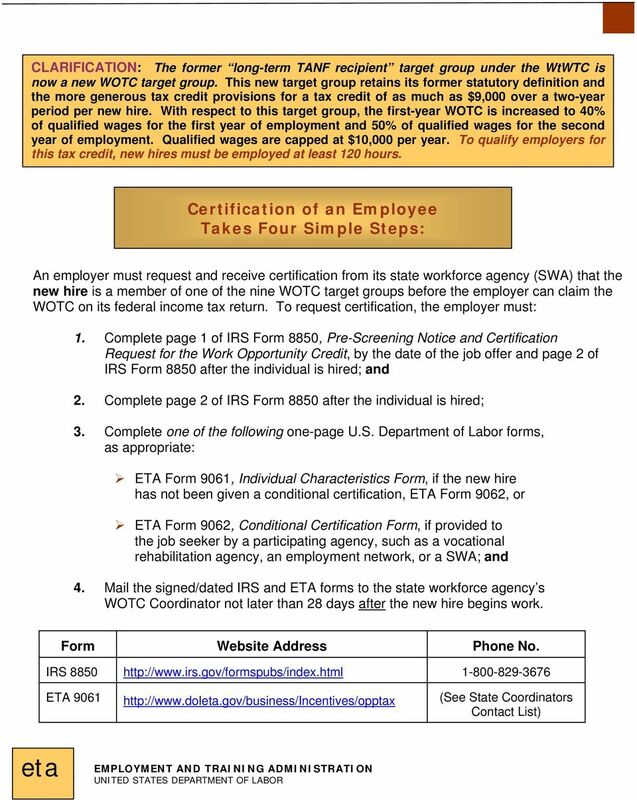 In This Fact Sheet:"
1 EMPLOYERS: 9 Ways to Earn Income Tax Credits for Your Company The Work Opportunity Tax Credit (WOTC): An Employer-Friendly Benefit for Hiring Job Seekers Most in Need of Employment Background and Updates: In This Fact Sheet: How to Earn a Tax Credit For New Hires How To Apply For The Tax Savings Where To Get More Information Use of the WOTC has substantially increased in recent years as Congress has expanded several target groups requirements, increased the tax credit for certain groups and introduced new flexible filing provisions. For example, during Fiscal Year 2007, over 655,000 certifications were issued by the state workforce agencies, and this figure is growing every year. 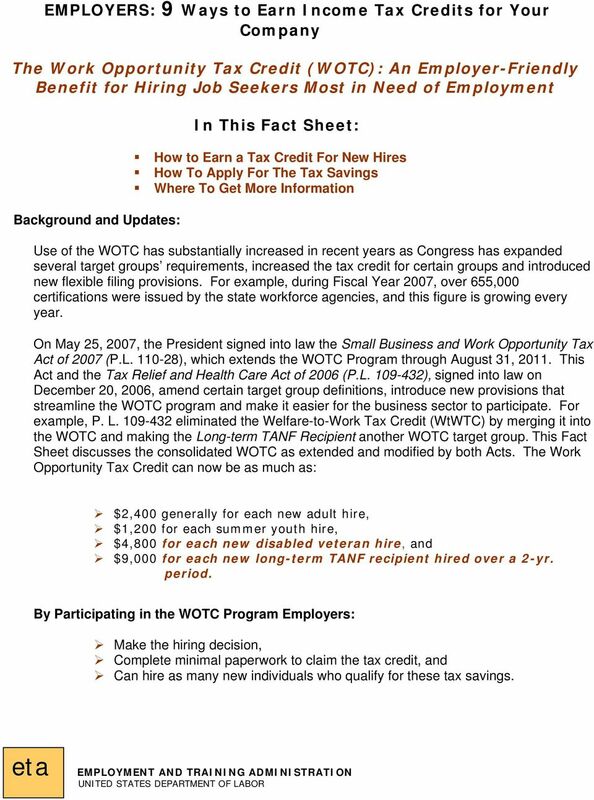 On May 25, 2007, the President signed into law the Small Business and Work Opportunity Tax Act of 2007 (P.L ), which extends the WOTC Program through August 31, This Act and the Tax Relief and Health Care Act of 2006 (P.L ), signed into law on December 20, 2006, amend certain target group definitions, introduce new provisions that streamline the WOTC program and make it easier for the business sector to participate. 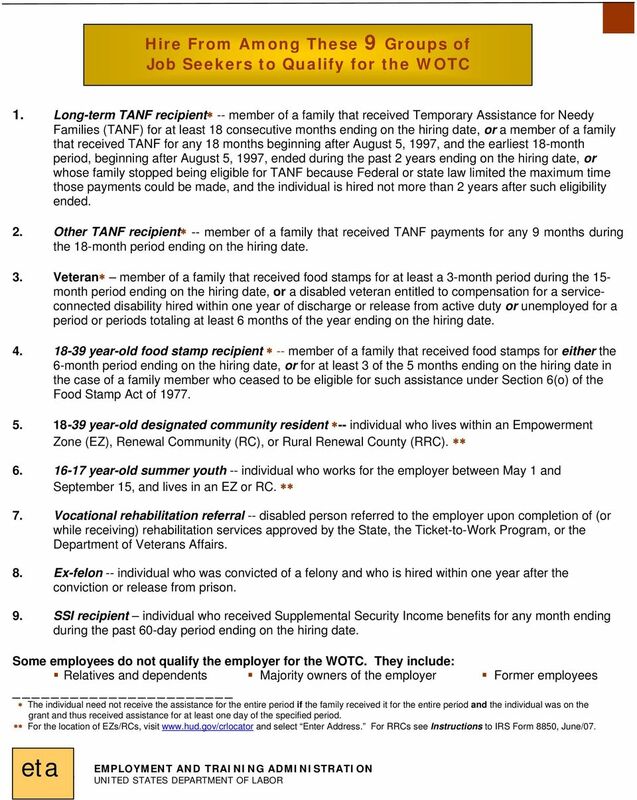 For example, P. L eliminated the Welfare-to-Work Tax Credit (WtWTC) by merging it into the WOTC and making the Long-term TANF Recipient another WOTC target group. 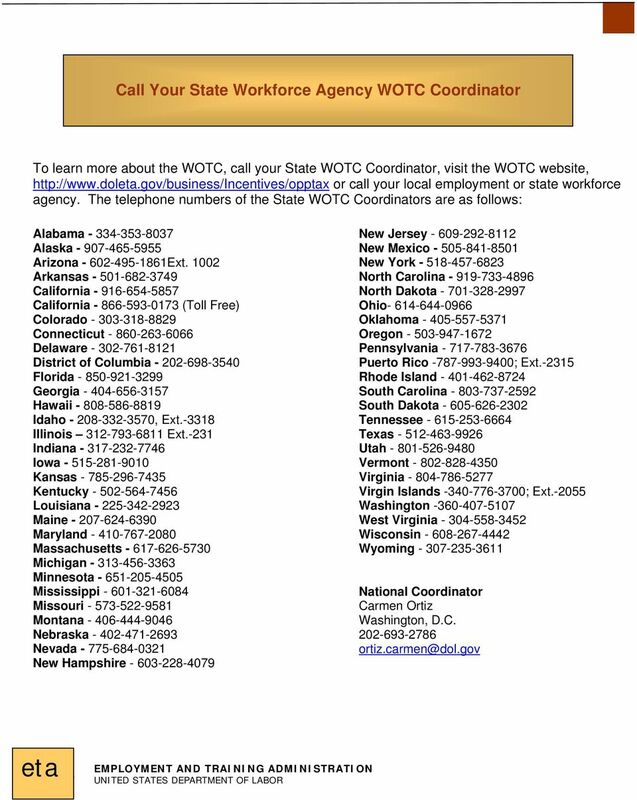 This Fact Sheet discusses the consolidated WOTC as extended and modified by both Acts. The Work Opportunity Tax Credit can now be as much as: $2,400 generally for each new adult hire, $1,200 for each summer youth hire, $4,800 for each new disabled veteran hire, and $9,000 for each new long-term TANF recipient hired over a 2-yr. period. 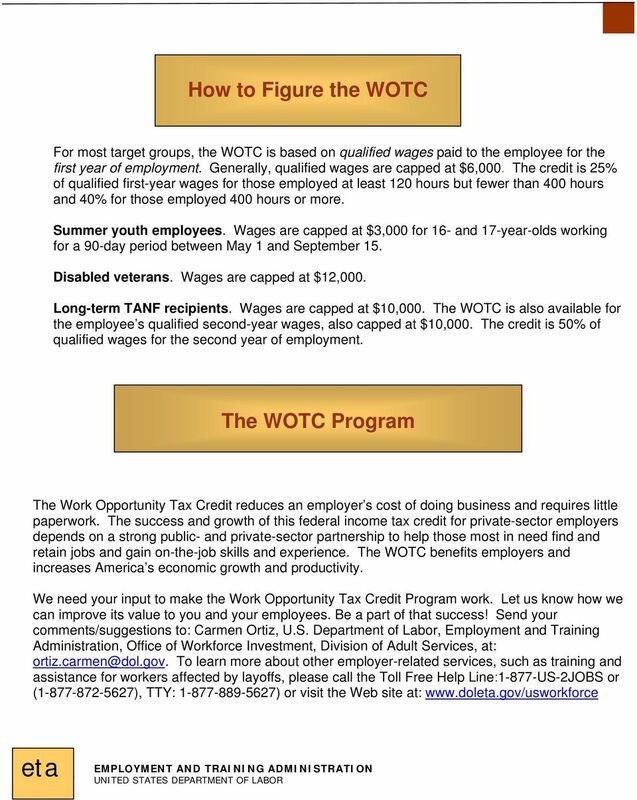 By Participating in the WOTC Program Employers: Make the hiring decision, Complete minimal paperwork to claim the tax credit, and Can hire as many new individuals who qualify for these tax savings.